We all know strong-arming someone into making a decision usually doesn't work. Encouraging them to come around through more gentle methods can lead to a much better conclusion for all involved. Harnessing the power of persuasion can have benefits in many areas of our lives. In this issue of the Pulse, we share a Big Think video by Daniel H. Pink explaining how to use persuasion to get people on board with our ideas. A recommendation from a trusted friend is a powerful thing. That's why it's surprising so many professionals neglect to iron out a strong referral strategy with their existing clients. 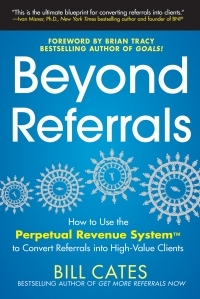 In this issue of the Pulse, we review referral coach and bestselling author Bill Cates' recent book, Beyond Referrals, and share some of his wisdom to extend the lifetime value of each and every one of our clients.